Fun and games are the way of life. Because all work and no play will surely end up making you a dull boy. And more so, when you got to work on the clock to earn those bucks. But, while most of us hit the bar to seek the ‘fun’, there’s always a better way. Unleash the child in you. Try out these super cool bubble balls that are sure to increase your fun quotient. Bumping into people sounds so not fun right? But won’t it be fun if you bounce when you bump? These balls are like a bubble suit that you put on around you and then you can go absolutely bonkers and start bumping into each other. 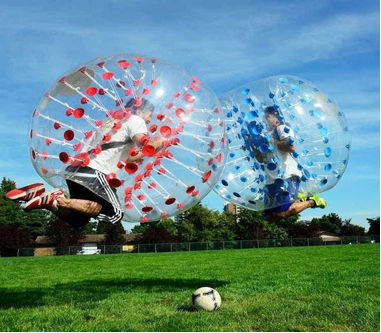 Ever thought how fun it would be to play soccer wearing one? How fun it might be to literally walk inside a bubble. Or jump, dance, or even run. Zorb balls literally lets you live in a bubble. This gigantic bubble ball will fit the entire you within. All you gotta do unzip it and enter your bubble. For playing something sporty you will need to find a lot of vacant space outside and then maybe you can challenge your friend to a race downhill or even to walk on water. You can fund affordable and cheap zorb balls for sale online. Ever played darts with your foot? Sounds preposterous right? But it ain’t. Foot dart is a mix and match of the old football and the indoor darts game. 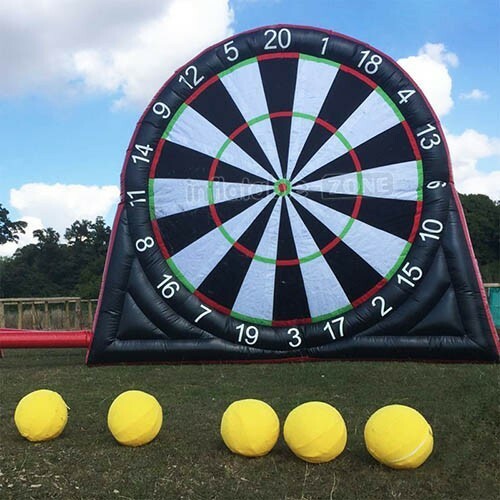 The original dart board is replaced with a jumbo inflatable dart board and you and hit the target with a football. A perfect solution for kids who dislike the running part of a football game. Challenge your friend to foot dart duel, but remember, they bounce back! The best part of camping is being out in nature, right? Then how about living in a transparent tent out in the wild? Watching the sun rise and set. Feels like living in the open but yet you feel protected from all the bugs and bear. Try out a bubble tent for your next camping trip and amaze everyone with your fabulous tent and see how people drool over to sleep with you, in it! You can even try it out for outdoor decorations which you don’t want to be spoiled by the wind and the rain. This will probably save you a lot of time to save on for that trip to Disney world that you kids keep nagging about. These are available in various sizes depending upon your affordability and how much space you have to put it up. You can easily float one up in your backyard when you host a birthday party for kids or use it a hide and seek fort while you play with along with them. Inflatable sports games are the new trending thing. First, because they omit the question of safety to a high level which makes it a super buy for parents and secondly because they actually make you work out in a fun way. Right now online is the best place to go buy one as it gives you a lot of variety over choices. Like, inflatable-zone.com is a exclusive e-store for inflatable sports goodies. They make high quality, long-lasting inflatable products which will fit right into your budget. Unleash the child in you. Try out these super cool bubble balls that are sure to increase your fun quotient.